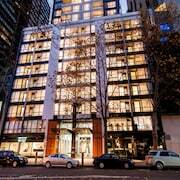 Located in Melbourne Central Business District, this hostel is within a 10-minute walk of Yarra Riverfront, Melbourne Convention and Exhibition Centre, and South Melbourne Market. SEA LIFE Melbourne and Eureka Skydeck 88 are also within 15 minutes. Southern Cross Station is 18 minutes by foot and Flinders Street Station is 22 minutes. 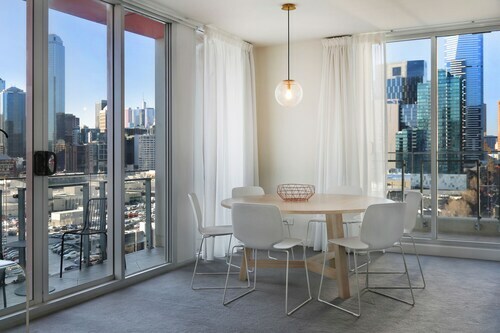 This family-friendly Southbank apartment building is located in the entertainment district, within a 15-minute walk of Southbank Promenade, Melbourne Convention and Exhibition Centre, and Eureka Tower. Eureka Skydeck 88 and South Melbourne Market are also within 15 minutes. Flinders Street Station is 18 minutes by foot and Southern Cross Station is 20 minutes. 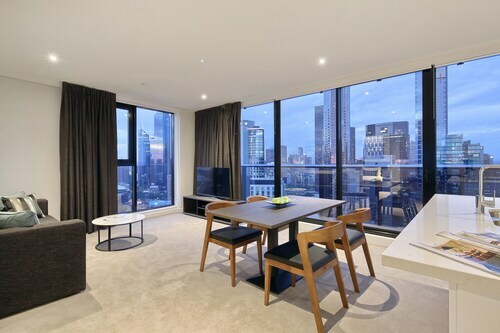 Located in Melbourne Central Business District, this luxury aparthotel is steps from Southbank Promenade, Melbourne Arts Centre, and Eureka Tower. Federation Square and Eureka Skydeck 88 are also within 10 minutes. Flinders Street Station is 6 minutes by foot and Melbourne Central Station is 21 minutes. Melbourne was once the capital of Australia, until some fancy committee decided to move the capital to Canberra. Canberra. But Melbourne isn’t bitter. It’s still considered Australia’s fashion capital, and at least they didn’t choose Sydney. 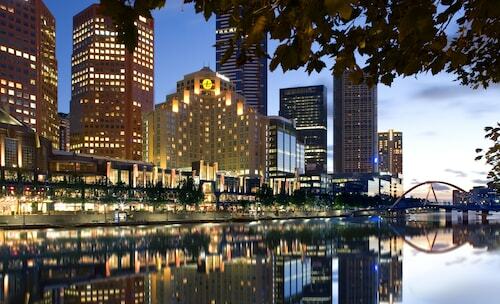 Plus, Melbourne has Southbank, and no other city can claim that! This unique neighbourhood is a little bit trendy, a little bit upscale and all class. Our Southbank travel guide will answer all your questions…except “What does the Melbourne skyline look like from 300m in the air?” You’ll have to visit for that one. How do I get to Southbank from the airport? The city has all the public transit you’d expect of a former capital, so getting to accommodation in Southbank on the cheap is easy. From Melbourne Airport (MEL), the SkyBus will take you 25km south to Southern Cross Station. From there you can hook up with the light rail to go wherever your heart desires. Or just take a cab from the airport, if that’s more your style. What are the most popular Southbank hotels? What kind of hotels are there in Southbank? Want to live in luxury? Check. Prefer your home away from home to feel like, well, home? 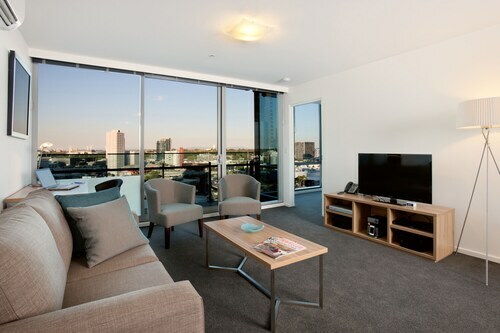 Apartment hotels in Southbank are your answer. The five-star Hilton Melbourne South Wharf is dressed to impress, with sleek rooms and the best linens this side of the Yarra. More than just a pretty face, it’s also got in-room spa services and a spot-on location connected to the Melbourne Convention and Exhibition Centre. At Cityviews 3 Bedroom apartment hotel, cook up a feast for the whole crew in the full kitchen, then relax on the rooftop terrace. It’s just like home, only better. 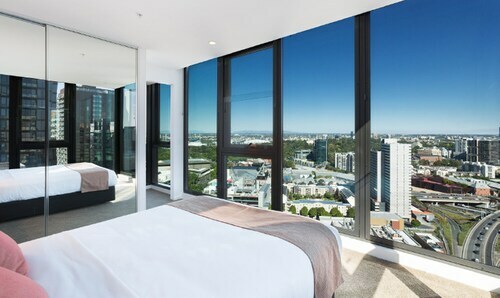 Where should I stay if I’m visiting Southbank? You’ve already got one thing right—choosing Southbank accommodation in the first place. Now it’s time to get specific. The Langham is an easy stroll from the artsy side of town. At National Gallery of Victoria, look up! The Great Hall has one of the largest stained-glass ceilings in the world. Seasons Botanic Gardens is for the romantics out there. Wander hand in hand through the Royal Botanic Gardens, getting lost amongst the trees—and in each other’s eyes. Ahhh, love. Southbank Views is next to the light rail, for travellers who like to go, go, go. Check out the CBD, pick up some produce at the South Melbourne Market and still be back in time for dinner—made from that produce, in your very own kitchen. What are some things to do in Southbank? Everything! All that stuff we mentioned is just the beginning. 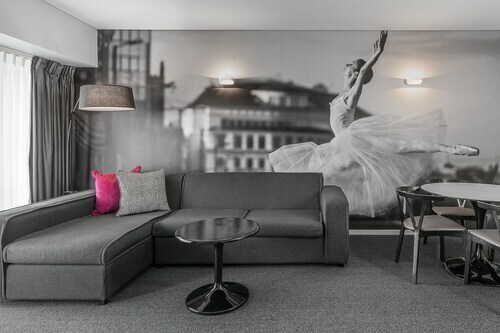 With a Southbank hotel, fun is never far. What’s been around the world 17 times and lived to tell the tale? Old Polly Woodside. No, it’s not a person. This 19th-century cargo ship is retired these days, but still home to tons of treasures. Channel your inner swashbuckler and swagger on over—you’ll be “hooked”. Speaking of treasure, the Eureka Skydeck 88 has a gold-plated observation deck. Can’t get enough heights? Check out Sydney accommodation and hop over to the Harbour City to get your heart racing on the Bridge Climb. Get cultured at Arts Centre Melbourne, home to two opera companies, the Australian Ballet, the Melbourne Symphony Orchestra and several theatre groups. Didn’t pack your top hat? Hamer Hall plays host to everything from reggae concerts to comedy. Make like a pirate and hoard your booty for the fun stuff. Wotif’s Southbank packages let you bundle your hotel and airfares so you save the most cash. Book today—and bring us back the latest fashions, please! Need insider tips on must-see attractions in Southbank? Check out our Southbank travel guide! How Much is a Hotel Room in Southbank? 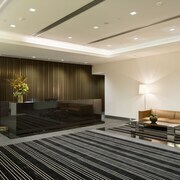 Hotels in Southbank start at AU$81 per night. Prices and availability subject to change. Additional terms may apply. The building and the location were great. The size of the room was very good. Excellent location and just a stone throw away from Yarra river. Very tidy place with full size windows and nice city views.